Die to Live is the third song off of the Alien Love Secrets album. It’s a simple song (compared to other Vai songs) with only one guitar, bass, drums, and some synth strings during the middle section. The three-piece band setup gives the guitar plenty of space and freedom – which is also why it’s a great backing track to jam to. The thick and creamy guitar tone stands out on this song, more than the other tracks on this album in my opinion. The guitar parts are a great example of combining rhythm and lead in a seamless way. In other songs, you’ll hear clearly separate rhythm and lead parts. In this song, rhythm and lead blur together. Steve Vai is one of my biggest inspirations for many reasons. While some guitarists claim that all he plays is ‘mindless shredding’, you don’t need to listen for long to find plenty of examples of expressive and emotive playing. 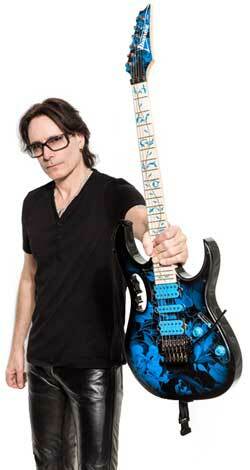 Check out my guide on Steve Vai’s tone, gear, and effects to learn more about him. His Alien Love Secrets album contains some incredible guitar playing. Each track showcases a very different style of playing and each one is worth studying. My favorite lick in this song (and I love a lot of licks in this song) comes in at around the 2:00 mark during the middle section. It’s a short lick that screams “VAI”. The song’s tempo is around 128bpm, so this is a fairly slow lick (compared to other Vai licks). The ‘x’ is meant to show a rake across the strings before the first note on the 16th fret. The entire middle section of the song is full of tasty licks. But this one stands out to me due to the way it jumps around. This could have been a very straight-forward descending scale run. Instead of descending down the scale, like many other guitarists would do, Vai ‘displaces’ some of the notes. Try playing it and you’ll hear a fairly uninteresting scale run. By ‘displacing’ those notes, we end up with a far more interesting lick. Try coming up with a similar lick on your own. Create a simple descending lick, then displace some of those notes. Start off with a simple pattern (eg: three notes down, jump up), before you try and create more complicated licks. The reason this lick works so well is that it keeps things relatively simple. Rhythmically, the lick is pretty straightforward. The triplets make it more interesting than doing the run in eighth or sixteenth notes. The long sustained synth chords in the background and the laid-back bass, provide plenty of room for the guitar to fill in space. It’s a good example of playing something in contrast to the other instruments. The backing chord behind this lick is a Eb/Ab (Eb with Ab in the bass). If you know a bit about Steve Vai, you won’t be surprised to hear that the lick is in Ab Lydian. Vai is well-known for using the Lydian mode and it’s a big reason why this short lick just screams “VAI”. Ab Lydian is the fourth mode of the Eb Major scale, which is why there is an Eb/Ab chord in the background. The Ab in the bass helps pull us towards the Lydian mode. The most important note in the Lydian mode that gives it it’s dreamy quality, is the #4. In Ab Lydian, this is the note ‘D’. Take a closer look at the lick and look out for any time it plays D. Every time you hear that note over the top of that chord, you’re hearing Lydian in action. Keep this in mind if you want to try improvising over the backing track for this song. As the song is at a fairly laid-back tempo, you shouldn’t have too much trouble bringing the lick up to speed. Holding a steady rhythm and keeping the other strings quiet should be your focus when learning this lick. Use both hands to mute the other strings and avoid accidentally flicking adjacent strings during slides or pull-offs. After you try the above picking styles, you’ll quickly figure out which style you prefer. Figure out the best way that works for you and how different styles change the way you play. Slower licks like this one give you plenty of room to experiment with your picking style, so make the most of it here. If you practice to a metronome, keep in mind you’re playing triplets. If you have a metronome that can count triplets out for you, that would be a nice way to ease into it. But eventually, you want to be able to easily switch to triplets without thinking about it. The big mistake I see a lot of guitarist make when trying to copy Vai’s tone is they dial in way too much gain. While Vai does use a lot of gain at times, he uses less than you might think. Rolling the gain back a little bit more than you think you should will give you better results. Check out my guide on Steve Vai’s tone here for advice on what pedals to use and how to think about his tone. The below video demonstrates the lick at full speed and half speed. Want to learn the rest of the song? If you like this lick and want to work on the rest of the song with me, consider taking Skype Guitar Lessons with me. I can help you work on this song, other Steve Vai songs, or anything else related to this style of playing. I can teach you to improvise over the backing track for this song and come up with your own licks that fit this style of playing. If you’re keen to take your playing further, contact me now to let me know what you’d like to learn in one-on-one Skype lessons with me.